Summary: In 1912 thirteen year old Turner Buckminster moves to Phippsburg, Maine with his mother and father. Within six hours of arriving he learns that Phippsburg boys don’t play baseball the right way, being the son of the town’s new minister is a trial, and his new neighbors take joy at giving him grief. Turner wishes that he could “light out for the territories” until he meets Lizzie Bright from nearby Malaga Island. Initially unaware that his friendship with dark-skinned Lizzie will be a problem in Phippsburg, Turner embraces his friendship with Lizzie and learns to find joy in clamming, boating with the whales, and meeting the good people of Malaga. Although Turner’s father and others in the town forbid him from returning to the island, and instead insist that he visit with an elderly neighbor, Turner finds a way to continue his friendship with Lizzie. When Turner learns of a town plot to remove the residents of Malaga Island, however, he feels helpless to defend his friend and her community. Through a series of tragic events, and in the midst of human greed and evil, young Turner learns the true value of acceptance, friendship, and what it means to love one’s neighbor. Literary elements at work in the story: Schmidt creates a novel with a rich setting. The Maine coast, its islands, cliffs, and shores provide an almost mysterious backdrop for the unfolding of the plot. And while the plot has numerous unexpected twists and turns, the beauty of this book lies in Schmidt’s ability to create beautifully rounded characters. As each part of the story unfolds, Turner grows and changes as a result of the challenges he faces and the people he meets. Instead of providing simple foils in some of the secondary characters, Schmidt allows these characters to become vulnerable and to change just as significantly as Turner does. Additionally, in terms of theme, Schmidt explores the way that perceptions – our own, as well as those of others – cloud our ability to see our neighbors as vulnerable human beings. As several conflicts converge within this theme, Turner learns to trust himself, to challenge others, and to stand up for what’s right. Perspective on gender/race/culture/economics/ability: The events that occurred at Malaga Island are true, and while this novel is a fictional account of what might have happened to a young boy during those events, the author addresses the conflicts over gender, race and economics in such a way that the reader feels close to both the real events and the fictional characters. Schmidt skillfully creates characters on both sides of the drama that resist stereotyping, both in terms of race and economic means. Turner learns to discern a person’s character, rather than relying on perceptions or opinion. While the town thinks he ought to be a boy’s boy, playing baseball and jumping off cliffs into the ocean with other (white) church boys, Turner finds joy in spending time with a young black girl and her preacher father. Turner sees the basic value of their lives apart from their economic status or their race. Ask students to consider the many cliques or groups they observe at school. What generalizations do students make about various groups? When have you felt like an outsider? What was that like? How did you feel? Consider a time when you were misjudged, or a time when you misjudged someone else. What do you think causes people to misjudge others? In what ways does Turner misjudge his father? Mrs. Cobb? Willis? How do various events and interactions with these people cause him to change? How do our perceptions of one another affect our ability to understand one another? Consider Turner and his father. Initially their relationship is plagued by assumption and misunderstanding. What causes each to better understand the other? What is ironic about the church leaders’ desire to remove the residents of Malaga? Where do you see this kind of irony today? How does Turner live out Christ’s call to “love your neighbor as yourself”? This review was written by Union Presbyterian Seminary student Catherine Lovejoy. 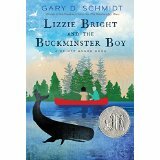 Lizzie Bright and the Buckminster Boy by Storypath is licensed under a Creative Commons Attribution-NonCommercial 4.0 International License. I loved this…as well as The Wednesday Wars and Okay for Now.